It’s been many years in the making, but we are finally bringing our Nuthouse website to the 21st century! That’s right! You can now find great information about your favorite Nuthouse products right here online! Not only have we put together dynamic pages with up to date information about our organization, products, and catalog, but we’ve also included a contact form so shooting off an email is quick and easy as well as a blog to keep you informed about our daily activities. It’s nice to finally join the new millennium, but what actually took us so long to get here and what about our web history and past? Back in the mid and late 90’s I always remember watching SportsCenter and listening to Chris Berman say something along the lines of “You can read more on the information superhighway, but if you’re like me then you may be stuck on the onramp.” That’s exactly where we’ve been for the past 15+ years stuck on the Information Super Highway onramp. 1990’s – If you take a peek at WhoIs you can see we registered the LANuthouse.com domain name back on October 1st, 1998. Yep! That’s just over 15 years ago! 2001 – Archive.org shows our first page with Earthlink albeit only the “coming soon” page on April 1st, 2001. April Fools! 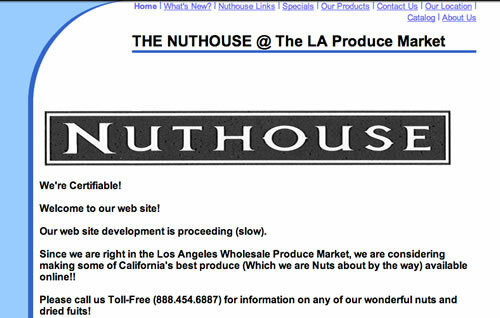 2004 – Archive.org shows our first official Nuthouse page on April 13th, 2004 (see the picture posted above). …and that’s the history of the Nuthouse website. The website is a work in progress and we still have a long ways to go before we are completely finished with the final designs. One of the great things about our new design is the blog. Stay tuned for updated information on some of our favorite Nuthouse products like peanuts, pistachios, cashews, almonds, walnuts, and much, much more. We also plan on getting a monthly email newsletter setup so we can update you directly at your inbox. Lots of exciting stuff on the horizon 🙂 Stay tuned! We’re taking a few small steps into the blogging world, but we’d like to hear what kind of things you’d like to read about? Do you want to hear about the freshest products, our newest items, how to’s and recipes, or something else? Let us know your thoughts in the comment section below or if you’d like to send us something a little more private then shoot us a quick email through our new contact page. Of course if you’re still using those old land lines please call us Toll-Free 888.454.6887 (NUTS) for information on any of our wonderful nuts and dried fruits!